Crispy Aloo Tikki Recipe (Aloo Patties) – The mixture is made from boiled, mashed potatoes and green peas with few spices. Then it is formed into the shape of patty. And shallow fried or deep fried with oil. This makes great evening snack or party appetizer or starter. This is popular North Indian snack that you get at every chaat stalls. But now a days it is popular in every region of India. You can enjoy them as such with some coriander chutney or ketchup. 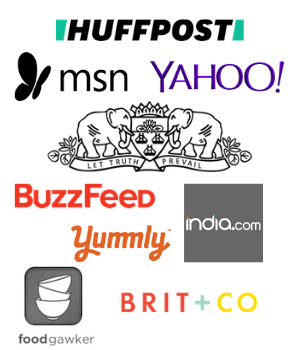 Or you can use in chaat recipes like aloo tikki chole or tikki dahi chaat. Or you can make aloo tikki burger using this. Only change you need to make is the size of the tikki as per your burger bun size. 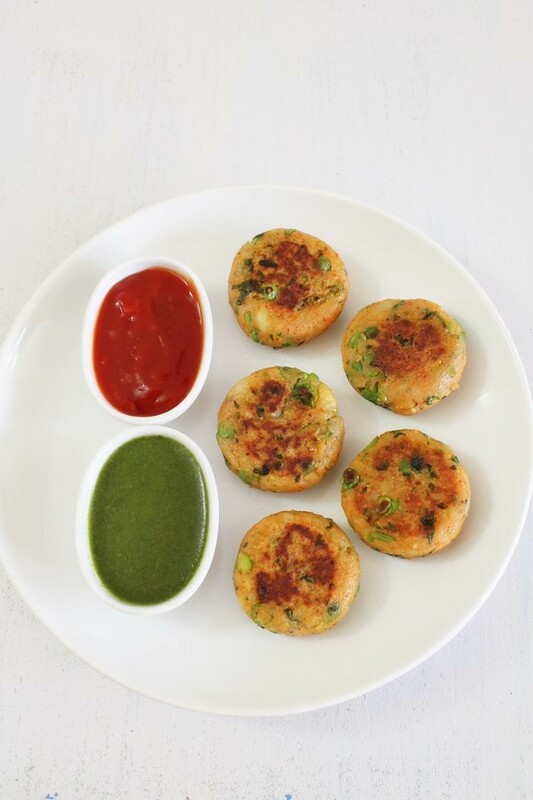 There are many variations of making aloo tikki. Some makes with only potatoes and spices which I make for ragda pattice. Today I made with potatoes and peas. While some makes it with chana dal stuffing, this version is called aloo patties. I got the idea of adding peas in tikki from Tarla Dalal’s recipe. Here I have shallow fried the tikkis, But if you want to go naughty then you can deep fry as well. This is really a party pleaser snack or appetizer. Make into small bite size pieces if serving as an appetizer. If making for big crowd then shape the patty day before, arrange them on tray on single layer. Cover with cling wrap and keep refrigerated. The next day bring the patty to room temperature and shallow fry them. Boil the 3 medium potatoes in pressure cooker. For that take washed potatoes in a pressure cooker, add enough water so potatoes are submerged in the water. Cover with the lid, put the weight on. Turn the heat on medium and let it cook for 2-3 whistles. The number of whistles may vary depending on the size and type of the potatoes. Also boil the ¾ cup green peas. I have cooked peas in microwave for 4-5 minutes for quick boiling. Since I have used frozen peas, it took less time. if you are using fresh peas then cooking time will be more. Take boiled, mashed potatoes in a bowl and add boiled peas. Mash both together using potato masher, so everything gets well blended. Add finely chopped green chilies, cilantro, red chili powder, chaat masala, and salt. Divide the mixture into 15 equal portions and make ball out of it. Take one ball a time, press lightly, seal the edges if it breaks. Make all the patty same way. I got ½ inch thick and 1 ½ inch diameter sized 15 tikkis. You can make as per your desire size. Heat the skillet in on medium heat for shallow frying. Add few teaspoons of oil. Once oil is medium hot, put the tikkis gently and carefully on the pan. Drizzle some oil on tikki as well. Cook till bottom side is brown and crispy. Once cooked then flip the tikkis using spatula and let it brown other side as well. Remove it to a plate. Shallow fry rest of the tikkis and serve. Serving suggestion: Serve this crispy aloo patties as a snack or starter with green coriander chutney or mint chutney, tamarind date chutney or ketchup. The outer layer is little crispy and inside is soft if they served hot. If you store or let it cool the outer layer will get soften as time goes. To get little extra crispy aloo tikki, use little more oil while frying. To make outer layer even more crispy, dip the both sides of tikki into the breadcrumbs or coarsely ground corn flakes and then deep fry. You need little extra oil because breadcrumbs will soak up more oil. As you can see, I have added little green peas. These are for some extra flavor and texture in the tikki. For a change, skip the peas and make tikkis with only potatoes and spices. Instead of green peas you can add boiled corn kernels, grated carrot, steamed and chopped green beans. Choices are endless. 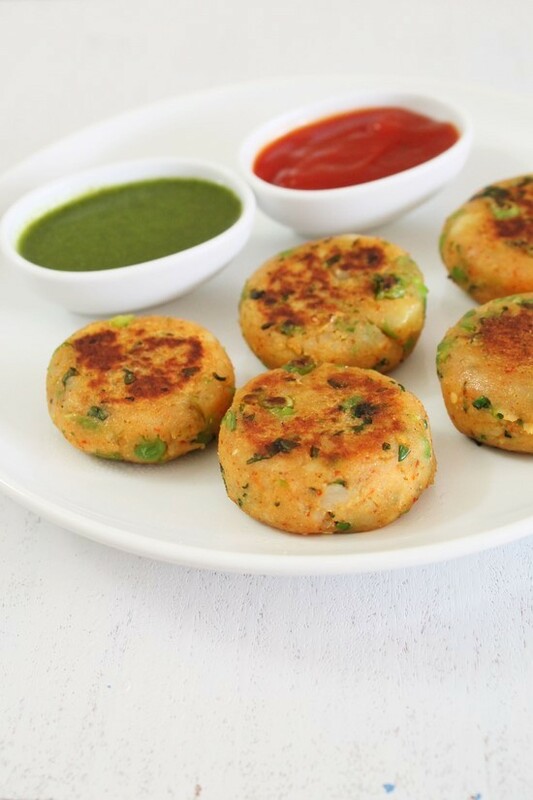 Aloo tikki recipe or aloo patties - these are shallow fried till crispy around the edges. Served as a snack with chutney or ketchup. Boil the potatoes in the pressure cooker till soft. Once cooled, peel and mash them using potato masher. Also boil the peas in pressure cooker or boil in microwave for 3-4 minutes. Frozen peas will get cooked faster than fresh peas. Take mashed potato and boiled peas in a bowl. Add rest of the ingredients except oil.. Mix everything together using your hand. It will come together like a dough. Divide the mixture into 15 equal portions and make tikki aka patty shape. Drizzle some oil on tikki as well and cook till bottom side is brown and crispy. Once cooked then flip them using spatula and let it brown and crisp up other side as well. Hi Lana, I love your recipes! How do you make chaat masala? I buy the packet from Indian grocery store.